One of the most popular trees for indoor bonsai, the Ficus genus consists of over 800 different species of evergreen trees, shrubs and woody climbers usually found in moist forests in tropical and sub-tropical areas of the world. Of these there are at least a dozen species and hundreds of varieties that are suitable for bonsai cultivation. As plants from sub-tropical and tropical areas, Figs are not frost hardy and need to be grown indoors when day or night temperatures are lower than 15°C; for much of Northern Europe this means that outside placement is only possible during June and July. Figs suitability for indoor growth is largely due to its tolerance of poor humidity levels and poor light levels that prevail in our centrally-heated homes. This tolerance to poor light is largely due to the native habitat of many Figs on the forest floor, shaded by the forest canopy above. Figs are able to tolerate poor humidity levels and dry air with their thick waxy leaves. It should be noted though that Figs will not grow well in poor conditions; the better the humidity and light levels are, the more vigorous the plant is. 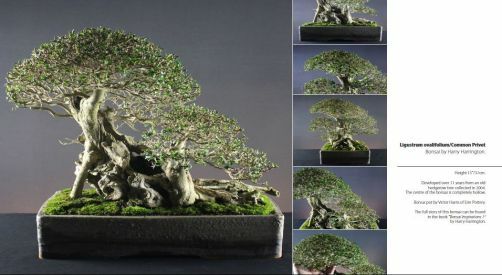 Ficus bonsai should be given as much light as possible to encourage strong growth. The following is a list of commonly used species; there are also large numbers of varieties of these species available and the suitability of these should be determined primarily by leaf size. Small, narrow leaves that produce excellent branch ramification. Is capable of producing good basal rootage and excellent aerial root formation in humid conditions. Has a habit of dropping leaves if stressed so should be kept in ideal growing conditions. Oval, thinly leathery leaves, easily available but less desirable as indoor bonsai. Has a habit of not taking severe reduction; reductions to the trunk and the branches should be made gradually. Also defoliates easily when stressed. Branches will quickly dieback if no foliage is left on them after pruning or defoliation. Always leave a strong bud or leaf at the very end of the branch to encourage sap-flow. Bears oval, glossy, dark-green leaves upto 10cm long though these reduce with ease. The Chinese Banyan is the probably the classic fig for bonsai especially favoured for its ability to regenerate from very hard pruning, its vigour and willing to cope under poor growing conditions. Bears glossy, dark-green leaves and small red/orange flowers. Readily produces aerial roots given high humidity levels. Rarely drops leaves and can withstand hard pruning. Glossy, dark-green oval leaves, again vigorous growing fig, readily producing aerial roots given the right conditions and reduces well. Variety of Ficus retusa that is often seen for sale, similar to previous species but is less tolerant to low light levels and poor humidity which can lead to the loss of inner leaves. Also worth trying are Ficus burt-davyi, F.regiosa, F.deltoidea, F.aurea/ Strangler Fig, F.petiolaris, F.palmeri, F.traiangularis, F.benghalensis, F.buxifolia/ Box leaf fig, F.carica/ Common fig, F.natalensis/ Natal fig, F.pumila/Creeping Fig.